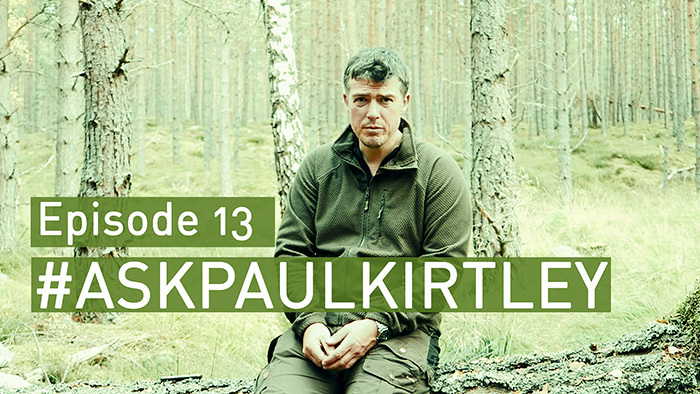 In this episode of #AskPaulKirtley I answer questions about boots, EDC kit, preparing your equipment for outings, getting started with animal tracking, bushcraft during the hunting season, alternative bow-drill positions and ways of managing without refrigeration while camping. The videos will be uploaded my YouTube channel and embedded in the Facebook Page associated with this blog as well as embedded here on my blog. I have found that for people who struggle to get to the ground to do the bow drill often find it easier to place the hearth onto a raise platform such as a tree stump/log, this allows the person to be standing with their leg on the stump to hold the hearth in place and leaning forward over the bow drill to put pressure down though the spindle. Thought I would drop a comment in case others may find it useful. I enjoy your easy style of giving top tips. Paul another great episode ,mind you a uncomfortable one for both of us those midges were even annoying me,lol. About boots for bushcraft … a more flexible less rigid sole allows you to tread more quietly when trying to get close to wildlife and allows you to bend your toes back when kneeling by the fire. More great Q & A’s. I just thought I’d share what boots I wear as an alternative to all the other brands you mentioned. I wear stilettos….. Of course I’m yanking your chain . Seriously, I wear Vivobarefoot’s off road hikers, these are a very flexible soled boot. I don’t really go in for the traditional outdoor/hiking boots as I find them too big, too rigid and too cumbersome for me personally. I prefer something that gives my feet freedom to move and feel the terrain underfoot, again my personal preference. They are advertised as fully waterproof, which they were in the beginning but started to let water in over time. I have since then started to pair them with sealskinz and polish the leather (something I hadn’t done in the first year of having them). Recently I dried them out too near the fire and Somme of the stitching has deteriorated rapidly and this is my only complaint. I just thought I would share what I use as an alternative to the standard footware out there’s look forwards to hearing you knocking more questions out of the park! I’ve met a few people recently who swear by the Vivo boots. I may look into them for a light camp boot, particularly for canoe trips, where I’m wearing a river shoe during the day but want a dry alternative for camp. Thanks for your kind words about the #AskPaulKirtley series. Thanks for your efforts Paul! Thanks for posting this link Bastiaan. Another interesting and informative episode. I think this has been asked before, any plans to make these available on iTunes? On the subject of boots I wear Hanwag Tatra GTX. I have found these to be extremely comfortable. Prior to this episode I wasn’t aware of the Lundhags which is a shame as I like the sound of the versatility you describe. I used Lundhags boots in the far north for many years and knew about them as a result of that. They make a wide range of boots so when it came to getting some new boots for wet forests and bogs, I thought I’d give one of their models a go. It’s been an interesting experiment and I should really write up my findings in a blog post before too long, especially as the boots are not cheap.